Thank you to all who participated in the September 4 event at the Civic Centre where the detailed streetscape design was on display. 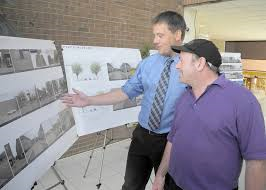 Below is a link to an updated website containing much of the material produced to date regarding the Downtown Chatham Streetscape Design project. There is more to come. Since early June, municipal staff have engaged the downtown community in preparing a detailed streetscape design. After a series of events intended to shape the project outcome, the design is nearly complete. The completed block-by-block detailed design will serve to facilitate future decisions regarding capital project implementation, including sidewalk reconstruction. One design element that still under consideration is the furnishing style. The September 4, 2014 presentation (Page 36-40) shows a contemporary option (this is not final) over reproduced Victorian inspired furnishings (benches, lights, receptacles, bike racks). I welcome any comments on this design element – they will influence the recommendation to Council coming later this year. Notable is the design option for the Cenotaph / Sixth Street / Memorial Plaza (Page 54-59 of the September 4, 2014 presentation). The proposal suggests higher end paving stone, special plantings, lighting, etc. to enhance this central, special, and connected downtown space. The Municipality of Chatham-Kent is planning to reconstruct some of the downtown streets in Chatham over the next couple of years. The first step in achieving this change is to undertake a public consultation process to review such things as sidewalks, lighting, cafes & patios, accessibility, trees, street furniture, safety, on-street parking, etc. A final streetscape design is to be completed in September, 2014.